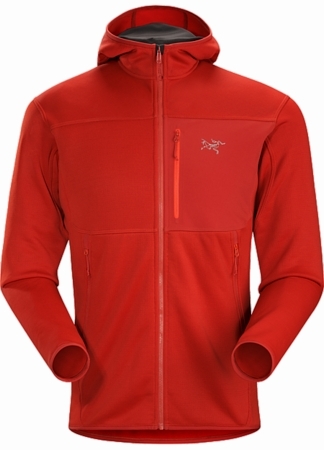 The Fortrez Hoody performs as a cold-weather layering piece and as a standalone on cool, drier days. The abrasion-resistant fleece, Polartec Power Stretch with Hardface Technology, provides warmth, stretch, sheds moisture, and layers easily. The streamlined ScubaHood fits comfortably under a helmet, and an integrated Phasic AR panel serves as a neck gaiter. Articulated patterning improves mobility, and the long hem rides comfortably under a harness and has a trim fit to help seal out drafts.